In the lockdown ward of a psychiatric hospital, Dr. Nadine Lavoie is in her element. She has the tools to help people, and she has the desire—healing broken families is what she lives for. But Nadine doesn't want to look too closely at her own past because there are whole chunks of her life that are black holes. Always Watching pulls you in by the end of Chapter one. It seems that the more Dr Lavoie comes to know about Heather the more her nightmares come to life. This had me not wanting to put the book down. The twists and turns in this book are amazing. Nadine is a character who is both hard to like and very easy to relate to, she is both brilliant and foolish but aren't we all?. 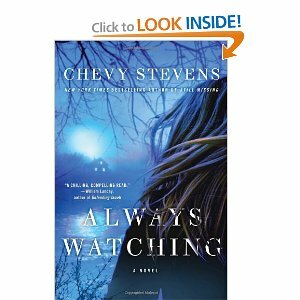 Chevy Stevens has written Always Watching to be a suspenseful and gripping read, and it will keep you up at night trying to finish the book. I did think that the ending of the book was dragged out but it was so good I can forgive her for that.The only minor complaint I have is the scenes between Nadine and Kevin, the book did not really explore the relationship between them. Other then that this book was perfect. Chevy Stevens has written another winner and I recommend this book to all readers who love a book that will keep you in suspense until the very end.